With the release of the 25th Anniversary of Back to The Future we thought it would be nice to take a trip back to the past and revisit an Amiga game by the name of Back to the Future Part 2. Those of you old enough to remember the early nineties and saving every penny for your Amiga games, will remember the one and only Back to The Future game released. Unlike the film which was absolute perfection - the game was a huge flop. A cross between Paper Boy and Golden Axe, it was so bad it was unreal. Sadly, like so many other hit movie releases, this game tried to take the success of the film and bring it to the gaming market. It was quite simply, badly developed with very little game play. The longplay video below shows some of the shocking levels and music. Now that almost 20 years have passed, we look forward to the release of a new Back to The Future game by Telltale Games. With some really good concept art, similar in many ways to the Simpsons or Family Guy, the game is a graphic adventure based on the franchise. The original actors, Christopher Lloyd and Michael J Fox have allowed Telltale to use their likeliness in the game and even their voices for the characters. 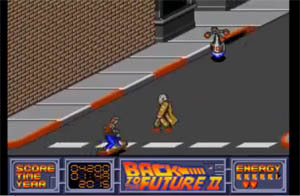 The game takes place after Part 3 and Marty is struggling to adapt to life without Doc. However, as always, Marty needs to travel in time to help the Doc who has become stranded again. The game will also be available on iPhone and Android mobiles.